Reviews Reviews from the Dark Side Supergirl #21: Ruh Roh Shaggy! Supergirl #21: Ruh Roh Shaggy! 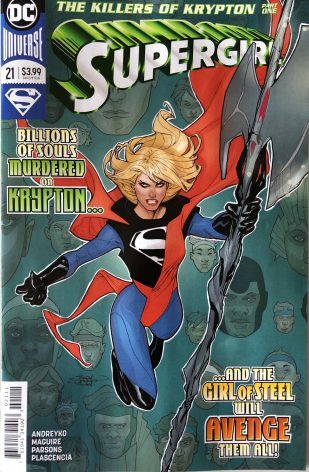 From the Publisher: Mourning the loss of the Kryptonians wiped out by Rogol Zaar, Supergirl decides to play detective and sets off into deep space to learn more about the would-be usurper. Using whatever tech she can scrounge, Supergirl builds a star cruiser, and after intel from Green Lantern, she blasts off into the cosmos with Rogol Zaar’s deadly ax to solve the mystery—along with a traveling companion you won’t believe! The recent events in The Man of Steel have spun off into several books. Most recently Superman, Action Comics and now Supergirl. Rogol Zaar has become a tipping point for the Kryptonian historical storyline. And now Supergirl is turning on her inner detective to figure out why Zaar destroyed Krypton. So… about the big reveal being touted on the internet: the suit she wears on the cover is NOT what she wears in the book. The only change that the suit has in the book is that it stores the sun’s energy. As such – the big “S” glows. Exciting? Probably not. The cover might have been a bit of a misdirect on this one. Still a cool cover by comic veterans Rachel and Terry Dodson. 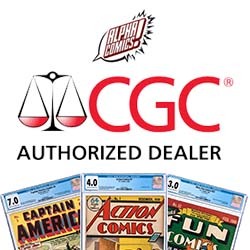 Right up front: this is not Superman or Action Comics. Supergirl is a softened version of the Man of Steel. Most of the book is Superman and Green Lantern trying to convince her that revenge is not cool. #norevenge. In the final bit of the book, she packs up all her Kryptonian toys and takes off with Krypto. Yes – she takes her dog on this DANGEROUS quest. So if you are looking for something that not quite so dark – this might be right up your alley. Both the story and the art fit the book very well. It’s more Scooby-Doo than Cartoon Network Late Night at this point but that’s alright. The story itself is interesting and could lead in a new direction; revealing more about the history of Krypton than we’ve seen in Action Comics recent Booster Gold time travel arc.